Universal is celebrating the 50th Anniversary of Orson Welles’ Touch of Evil with a two-disc special edition featuring all three versions of the film (the 1958 release version, the longer preview cut discovered in the mid-seventies, and the 1998 Walter Murch reconstruction), plus commentary on each disc by different folks, the complete Welles memo, a couple of featurette, interviews and such. This will be the first time either of the those earlier two versions have actually been home video in their original state (the old VHS and laserdisc releases of the film were of a studio job that combined footage from both of those old versions into one hybrid version). The anniversary branding explains the delay in the release, something fans have been expecting ever since the Murch-helmed reconstruction. The release date October 7. See the press release for the complete details on the release. Paramount's DVD release of "Seven Men From Now"
A release sure to receive less publicity but one that is equally exciting to me, however, is Sony’s Budd Boetticher Box Set, a collection of the Columbia “Ranown” films directed by Boetticher and starring Randolph Scott. The release has been long in the coming as only a couple of the films had been released to VHS (and those on substandard Goodtimes videos). Paramount’s 2005 DVD release of Seven Men From Now, the first collaboration between Boetticher, Scott and screenwriter Burt Kennedy, only whetted my appetite for the rest of the films. Seven Men From Now (1956) set the tone and lean style for series, as if it was carved it in the stone-like visage of Randolph Scott’s weatherbeaten face. 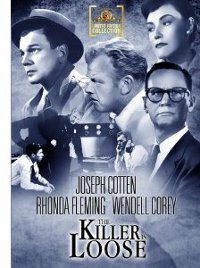 Boetticher had just come off a two-year stint with Universal, where he cranked out journeyman assignments (including his first westerns) with a muscular sense of action and place, and the austere little crime thriller The Killer Is Loose when producer John handed him the terse script by Burt Kennedy. 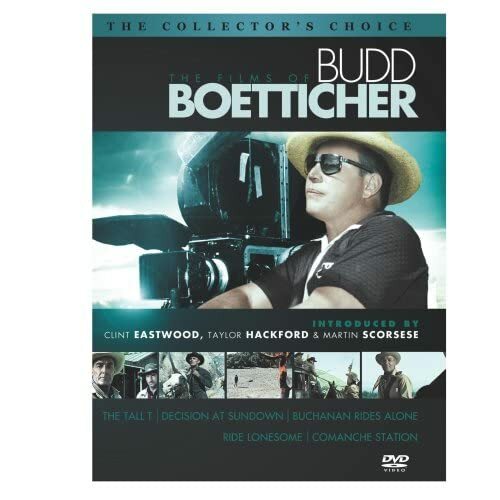 More than perfect fit with Boetticher, it brought the best in the director. Boetticher pares himself down to the rugged essentials and wrenches up the tension between the central characters, isolated in the empty desert, with remarkable economy. He makes Kennedyâ€™s dialogue sing like lyrics and turns Scott â€œlimitationsâ€ as an actor into an expressive element of character: inexpressive and inflexible, hard, his voice that masks his feelings and his lanky body is perfectly at ease setting a horse or handling a gun but less sure in moments of emotional intimacy. Producer/star Scott realized that he had a winning combination and immediately signed Boetticher up to direct for his own company at Columbia Pictures, where he cranked out low budget westernsthat made enormous profits. The made five films together at Columbia â€“ The Tall T (1957), Decision at Sundown (1957), Buchanan Rides Alone (1958), Ride Lonesome (1959), and Comanche Station (1960) â€“ three of them scripted by Kennedy. From The Tall T to Comanche Station, you can see Boetticher and Kennedy honing the style and structure established in 7 Men to a laconic austerity. That cycle stands next to the greatest works of Anthony Mann and John Ford: tight, taut, often savage little pictures that are both graceful and visceral, direct, and rich in character.